As a student of the New Testament, I collect “Jesus Books.” I don’t agree with the conclusions of all the authors, but I buy them and read them anyway. That’s because I like to talk about Jesus, and I like to listen to others talk about him too. For me, it is a way to be in community with people who have thought a lot about Jesus. That’s why I like E.P. 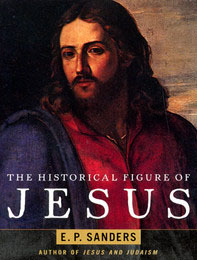 Sanders’ book The Historical Figure of Jesus (1993, Penguin Books, about 275 Pages). In his work, Sanders sets out to provide what he calls a discussion of “Jesus the human being” (p. 2). Although, as Sanders notes, Jesus had a theology, and his life was inseparable from theological implications, he does not want that to be the focus of his work. For Sanders, the aim is to look at Jesus as a figure of history. Chapter one begins with a description of his sources. These are the gospels, the writings of Paul, and the other literature found in the New Testament. For Sanders, these sources “leave a lot to be desired” (p. 4) because they are not written in the language in which Jesus taught, and they are assembled in ways that serve the purposes of Jesus’ followers. According to Sanders, that purpose was to “glorify their hero” (p. 3). Therefore, since there is nothing that Jesus himself wrote, the historian is left to piece things together from the writings, traditions, and movements that have arisen on the basis of what Jesus’ followers did with what he taught them (or what they thought he was teaching them). “I believe there were continuities between what Jesus himself thought and what his disciples thought after his death, and between what they thought and what the Christians of later centuries believed” (p. 2). Nevertheless, Sanders will appeal to the writings of the earliest Christians (especially within the canon of the New Testament), as well as what can be known about the world of Jesus from other sources in order to try to find him within an accurate historical, political, religious context. This will, among other things, enable the student of the historical figure of Jesus to answer important questions about him. Some of the biggest questions, according to Sanders are “why did he stir up controversy, why did he have enemies” (p. 5), and why he was ultimately crucified by Rome at the request of some of the Jewish leaders? Chapter two provides a basic sketch of the life of Jesus as pieced together by the gospel accounts and other New Testament sources. Chapter three begins to pull various strands of the life and world of Jesus apart by beginning with the political setting of Jesus’ world. The author notes that Palestine was under the rule of Rome at the time, but that their strategy was to leave the region alone in the sense that they entrusted oversight (under their authority) to local leaders and rulers who were loyal to Rome, and familiar with local customs (which included both governmental and religious leaders as needed). Chapter four expands on the religious aspects of Judaism at the time of Jesus, noting particularly Israel’s devotion to monotheism, their sense of status as “God’s chosen people,” the role of the Law of Moses, and the basis of relationship with God (e.g., repentance, punishment, and forgiveness). Of great importance was the central idea that the law “brings the entirety of life, including civil and domestic practices, under the authority of God” (p. 37). Because of this value of primary devotion to God and His law, Jews considered submission to pagan rulers, and assimilation into pagan ways of life an abomination. This, as Sanders demonstrates, led to the development of various parties, such as the often-mentioned Sadducees and Pharisees (and others) who “stood up and claimed to be the truest representatives of God” (p.48). For me, this is centrally important in understanding Jesus’ conflict with these groups. Jesus, in fact, joins them in standing up (while he simultaneously dismisses them), by claiming to be the one person – outside of any party or other affiliation – who, all by himself, represents God’s interests and ideals for Israel and the whole world! In Chapter five, Sanders moves away from the gospels and toward other external sources that provide insight into the world in which Jesus lived (and died). These sources are only moderately helpful in that there is virtually no mention of Jesus (with minute exceptions) outside of the writings of his followers. For Sanders, the question about the references to Jesus, whether by those who believed in him or those who didn’t is, “Which ones are right, and which ones are completely wrong?” (cf. p. 56). Continuing with the theme of sources, Chapter six identifies what Sanders calls “The problems of the primary sources.” The author outlines five problems: (a) What we do have written down is not a narrative of Jesus’ life, but various passages that are arranged by his followers to tell the story as they believed it should be told. What if they got the context or meaning wrong? (b) Some of the material, says Sanders, was either revised or created by the early followers of Jesus, (c) the Gospels were written anonymously, (d) the Gospel of John is very different from the others, and (e) while there is biographical information in the gospels, they lack many characteristics of biography. I personally have stopped calling the Gospels the “life story of Jesus” (as I have heard other preachers call them), and instead refer to them (as I think they are intended to be understood) as “Good-news announcements about the birth, life, death, and resurrection of Jesus Christ.” In short (and Sanders agrees), the Gospels are not biographies. They are messages that also contain biographical information. Chapter seven is a discussion of what Sanders calls “Two Contexts.” These are (a) “the gospels’ view that Jesus was the fulfillment of Jewish salvation history, and (b) the view of Jesus’ predecessors and successors that the climax of history was at hand. According to Sanders, the gospel writers presented these two contexts as overlapping ideas that tell Jesus’ story, as they believed it ought to be told. Chapter eight expands on how the early followers of Jesus told his story by featuring Jesus carrying out his ministry within the setting in which he lived. For me, this is vital. Jesus cannot truly be understood if he is reduced to a religious icon and universal wisdom-teacher devoid of a particular context. The closer I have looked at the world in which Jesus lived (as Sanders attempts to do in this view of Jesus), it seems that the meaning of Jesus’ life and mission becomes clearer to me. Chapter nine zooms in from the broad overview of Jesus’ life and ministry, and examines the various ways in which the gospel writers launch into their respective accounts of the beginning of Jesus’ public ministry. Each of them presents Jesus as the pleasing Son of God who personally identifies (through baptism) with Israel’s call to be God’s anointed servant, and represent God’s interests in the world. His ministry emphasized the proclamation of the Kingdom of God, and calling people out of sin and corruption to identify with him as the way to God. However, in the chapter the author is very ready to dismiss much of what the Gospel writers are saying about Jesus’ temptation and acceptance of his divine call as “legendary and mythological” (p. 131). In chapter ten, the miracle accounts in the gospels are discussed. For me, this is the chapter where Sanders begins to fall off the rails when he writes that, with respect to the miracle accounts in the gospels, “Historically none of this is accurate” (p. 134). Further, he mistakenly concludes that the idea that Jesus was a real human being was “condemned as heresy” in the second century (p. 134). For me, this is where my respect for Sanders as a historian begins to take a nosedive. Much material in the chapter is given to discuss the concept of miracles in Israel’s history, and much of the rest of the world, with constant allusions to the use of miracle stories as a means of manipulating or even deceiving people (cf. especially pp. 145-146). Sanders is ready to explain most of what the Gospel writers present as psychosomatics, coincidences, mistaken perceptions, circumstances that are explainable by other reasonable explanations, or even legends that were passed down (cf. p. 158). In chapter eleven, the author accurately portrays the message and ministry of Jesus as an announcement of God’s reign coming into the world through him. Sanders concludes that it is impossible to arrive at what Jesus actually meant by “Kingdom of God,” since there are so many references to it in the New Testament, and many of them seem to be saying completely different things. His own interpretation (without knowing exactly what it means) is that “Kingdom of God” is another way of saying “That God will rule the earth” (p. 169), and gives attention to the already-not yet theology of the kingdom that has emerged over the past 100 years (cf. p. 171). Much of the rest of the chapter discusses how Christians have wrestled with the meaning, the implications, the dynamics, and the timing of the consummation of the Kingdom throughout Church history (and how, because things don’t often go according to various conclusions, these theological systems and conclusions have had to be revised). Chapter twelve widens the scope again, the moves from Jesus’ message and ministry to its implications for Israel, the Gentiles, and individual people. Attention is given to the discussion of Israel’s hopes for a messiah that would lead them to national Glory, their disappointment with Jesus (since he was not a military messiah), and the fact that the Gospel writers want to portray Jesus as a messiah who wants to bring all the nations into relationship with Israel’s God in himself (by identifying with sinners as a friend, by caring for them, and by calling them to repentance, forgiveness, and new life in relationship with God and God’s people). Though Sanders does not seem to be presenting Jesus from the perspective of a believer, Chapters eleven and twelve do a better job talking about what Jesus was trying to do than what I have heard from many bible-believing Christians. Chapter thirteen expands the discussion of “Kingdom” as a qualitative and substantive “reversal of values, and ethical perfectionism.” From my perspective, this version of Jesus’ ministry is most attractive to non-Christians and theological liberals who want a Jesus who teaches and embodies an idealized moral/ethical system (whether or not he is actually the divine son of God). In the end, Sanders sees Jesus not as a scowling legalistic moralizer, but as a joyful encourager who also happened to be a moral “perfectionist.” But he cautions the reader to define perfection as God-likeness with respect to showing mercy and compassion as God shows them. This is an attractive and helpful way of looking at perfection, in my opinion. Chapters fourteen through seventeen serve as a fairly cohesive unit. In chapter fourteen, Sanders looks carefully at the real reasons Jesus got in trouble with certain Jews and Rome. From his perspective (and I think he’s right), Jesus didn’t get in trouble for a message about God’s love, or encouraging people to love one another. In chapter fourteen, Sanders provides a good amount of material about the various types of conflicts that Jesus got into during his ministry. The first section has to do with interpretations of the Mosaic law, in which Sanders seems to believe that Jesus’ conflict with the Pharisees had to do with his indictments of them for not understanding the heart of the law, and not taking it as seriously as they ought to (which, for a group of people dedicated to the law, would be pretty insulting, and result in conflict with the person/people making such an accusation!). In addition to this, Sanders (rightly, I think) points out that Jesus’ conflict with other groups who believed they were following the Law correctly centered on the fact that he was telling people to follow Him as the means by which they would fully understand the purposes of God. In that sense, Jesus was not leading a movement that was against the law, but was rather proclaiming that his life and ministry was a complete fulfillment of the law, and that everyone ought to, as an affirmation of this reality, follow him. Chapter fifteen hones in on Jesus’ self-image as he is presented by the Gospel writers. Jesus’ self-references (especially titles that he gave himself, or titles that Jesus allowed others to use with reference to him), are discussed with special attention given to Christ, Messiah, Son of God, and Son of Man. For Sanders, it is obvious that Jesus thought he was some kind of King, and “God’s last emissary,” (p. 248), but he is not ready to make any conclusions about exactly what that means, and he does not believe that the meaning can be conclusively determined by what is presented in the Gospel writings. For Sanders, there is ambiguity, lack of clarity, and inconclusive information about the exact meaning of Jesus’ claims and references to himself. Chapter sixteen finds Jesus in Jerusalem during the Passover on the final week of his life. He covers the five key events of the week: (a) Jesus’ entry into the city on a donkey, (b) Jesus’ action in the temple, (c) Jesus’ final meal with his disciples, (d) The arrest and trials of Jesus, and (e) Jesus’ final interrogation by Pilate, who “ordered that he be crucified for claiming to be King of the Jews” (p. 253). I find Sanders’ argument that Jesus was crucified for claiming to be a King to be very compelling, and to make the whole ordeal make sense. For Sanders, all of the actions of Jesus are symbolic. They are keys to interpreting the meaning of his life and ministry. The chapter ends with the final trial, mockery and scourging, crucifixion, and death of Jesus on the cross. He will not deny that something very real happened to them, but he does not know how to explain it. In all, I recommend the book for those who want to engage in the discussions of the historical Jesus, and who want to see Jesus in light of the world he lived in. For me, that has been crucial to understanding the New Testament, and the meaning of the birth, life, ministry, death, burial, resurrection, ascension, and soon-return of Jesus. Have you read this book? Are you familiar with E.P. Sanders? Comment below and join the dialogue. Want to buy your own copy? Click the green button and shop away! Je vous remercie! Je me pose toujours une question à propos de cela. Il y en a beaucoup qui lisent chaque année, mais personne n’a jamais laissé de commentaire pour interagir avec cette publication. If any of you should ask me for an epitome of the Christian religion, I should say that it is in one word – prayer. Live and die without prayer, and you will pray long enough when you get to hell.